Until recently, I wasn't sold on the entire Hunger Games franchise. 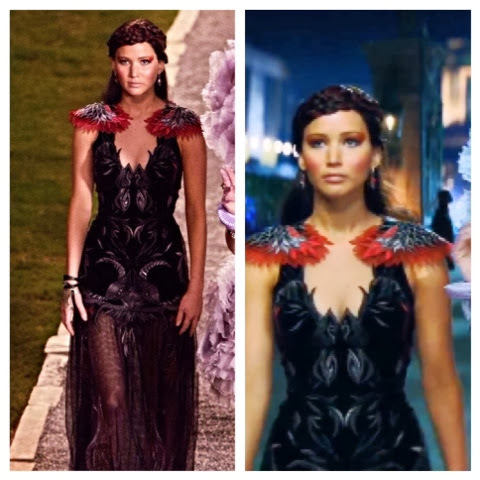 But through Trish Summerville's costume design in Catching Fire, I became intrigued. The first movie, to me, was slow and overdone. There are so many dystopian books and movies today that the Hunger Games just felt like another regurgitated version. I wasn't planning on watching any more of the movies until buzz about Catching Fire rumored it was ten times better than The Hunger Games. So I saw it in theater a few days ago, and I was surprisingly impressed. Not only were the plot and acting better, but the costume design was taken to another level than any other movie I've seen this year. Summerville, also the costume designer for the American version of The Girl with the Dragon Tattoo, curated an entire world of costumes. She had to dress both the modest district dwellers and the extravegant Capitol citizens. 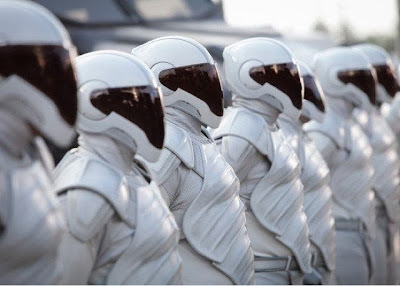 Then there were the Hunger Games uniforms, more streamlined and modern than before, and the intimidating, Peacekeeper uniforms inspired by the praying mantis. She put a massive amount of detail into every key piece and gave the film a high fashion attitude. Her dark and edgy style made the previous film look like child's play. She used many pieces from Alexander McQueen (which made me squeal like an excited little girl), as well as handmade clothes from emerging designers. She was thoughtful enough to have a balance of labels and knew the importance of exposing lesser known talent. I've made this kind of prediction before (sadly, I was wrong last year), but I stand behind Summerville to win the Academy Award for Best Costume Design. Before I saw this movie, I was certain Catherine Martin would win for The Great Gatsby, but Summerville proved the Catching Fire wardrobe to be a much larger task. 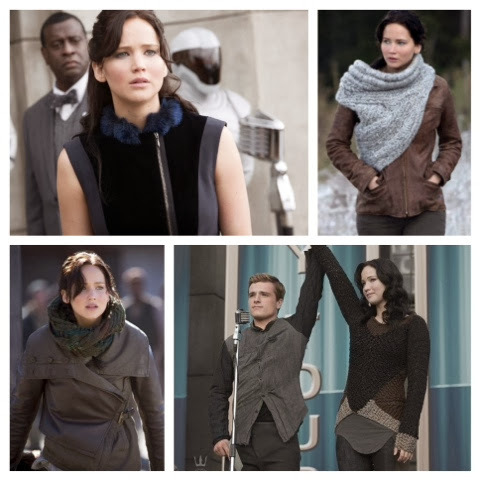 The very first garment you see in the film is Katniss' stunning cowl/scarf/shawl. No one really knows what to call it, but they all agree that it's too amazing for words. Designed by Maria Dora, this unique piece of knitwear is the talk of knitting bloggers and has inspired numerous DIY patterns. 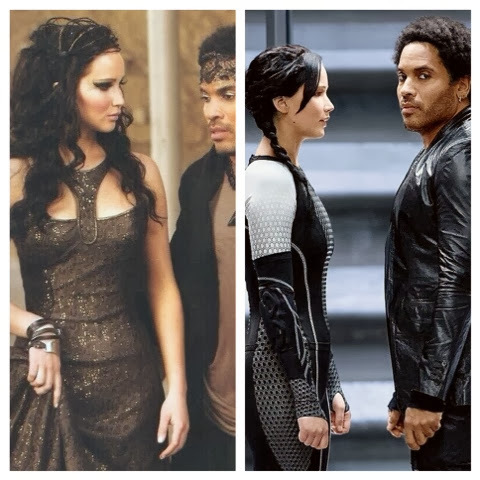 Every outfit that Katniss wears throughout the tribute tour is perfect. There's really no other way to put it! Summerville balanced the style of the Capitol, where Katniss was now a celebrity, with the down-to-earth style of her district. She wore a lot of leather, deep colors and blacks, and great knitwear. The biggest moment of her wardrobe, however, was her wedding gown. Designed by Tex Saverio, the dress had an intricate, metal bodice created with 3D printing. 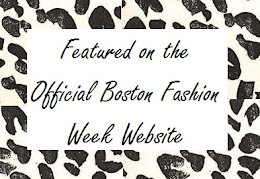 The full skirt was layer upon layer of cascading silk ruffles, weighing in at 25 pounds. 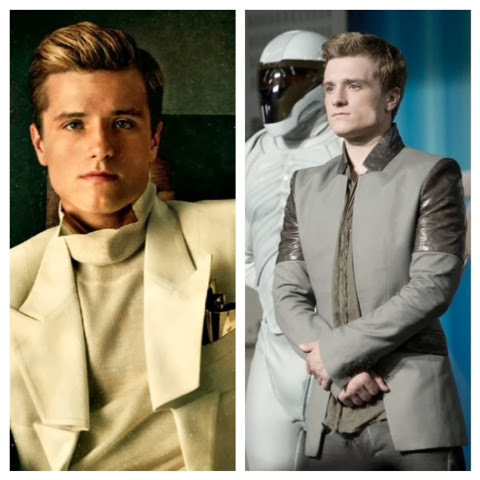 With Katniss' switch in style came a more sophisticated wardrobe for Peeta. He too donned more leather and darker colors. Most of the pieces were simple, but kept with current menswear trends. For his formal looks, Summerville gave him a gold neck piece similar to a bow tie, but worn tucked into his collar. 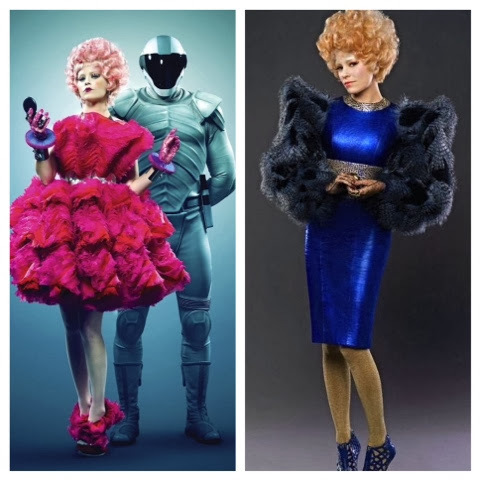 As a Capitol fashion maven, Effie must have been an exciting character to dress. She maintained her over-the-top, couture dressing, but Summerville incorporated more McQueen and fewer puffy, 80s sleeves. Her pieces completely surpassed the previous movie in detail, materials, and styling. Her dresses had intriguing textures and colors, the McQueen one was made entirely out of feathers painted as monarch butterflies. Her shoes, hair pieces, and accessories were dynamic and added to, not distracted from, her ensembles. 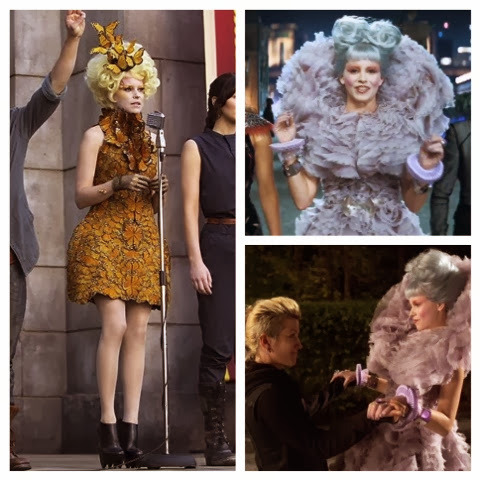 While a minor focus of the costume design, the tributes' clothing was equally innovative. Johanna's biggest look was her tree inspired gown made with cork at the neckline. 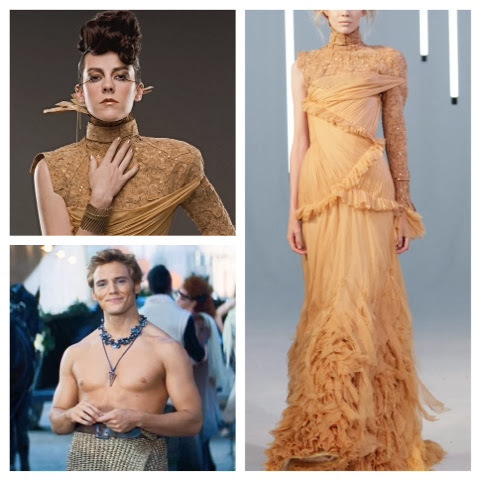 Finnick had an interesting ensemble for his chariot outfit - a skirt made out of scales and a shiny, shell necklace - keeping with the detailed and textured aesthetic of the movie. Lastly, Summerville created an insect inspired costume for the peacekeepers. Half praying mantis and half stormtrooper, they were intimidating and breached the line between human and robot.